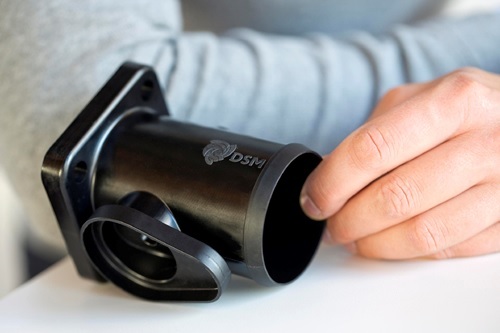 Royal DSM, the global Life Sciences and Materials Sciences company, has launched Arnite® A-X07455, the first high performance PET (polyethylene terephthalate) engineering plastic that is highly resistant to hydrolysis. This breakthrough development opens up opportunities for significant weight and cost benefits over metal in automobile engine compartment applications. As a result of continuous engine downsizing, particularly in the compact car segment, temperatures under the hood are going up, putting extra demands on plastics components used in this area. On top of this, identical electronic components are used in vehicles sold and used worldwide, which means they need to operate under a wide range of temperature and humidity conditions. Therefore, there is an increasing need for materials that retain key properties such as strength, stiffness and impact strength under demanding hot-humid conditions. Arnite A-X07455 enables substitution of metals or higher cost engineering plastics such as polyphthalamides (PPA) and polyphenylene sulphide (PPS) in automotive parts that require high dimensional accuracy, good chemical resistance, and very good mechanical properties. It will enable car makers to save costs and improve fuel efficiency through light weighting. This hydrolysis resistant Arnite A is being targeted at a variety of automotive under-the-hood applications, including throttle valve bodies, sensors, air control valve housings, electronic throttle control (ETC) and exhaust gas recirculation (EGR) covers, and ignition systems. The new product, apart from being highly hydrolysis resistant, also exhibits high stiffness, strength and dimensional stability. Arnite A-X07455, which contains 50% glass reinforcement, has a tensile stress at break of 200MPa, according to ISO 527.